Caption Congo’s Virunga National Park / Amanda Jones / An 8-month-old baby gorilla takes a look at the camera. Caption Emmanuel de Merode / Amanda Jones /Emmanuel de Merode, Virunga National Park’s director, has vigorously protected the park and its animals and opposes drilling for oil in the area. In April he was ambushed and shot four times, but survived. Caption Congo’s Virunga National Park / Emily Scott Pottruck / Patrick, a caretaker at the Virunga gorilla orphanage, cradles Ndagazi, a female he has helped raise since the death of her mother when she was an infant. Caption Congo’s Virunga National Park / Emily Scott Pottruck / Humba is the dominant silverback of one of the park’s gorilla families. Caption Congo’s Virunga National Park / Emily Scott Pottruck / A female gorilla rests during a rainstorm in Congo’s Virunga National Park. The nearly 2 million acres in the Democratic Republic of Congo encompass some of the world’s most biodiverse topography: glaciers, tropical rain forest, acacia savanna, lakes and active volcanoes. It’s home to mountain and lowland gorillas, chimpanzees, tree-dwelling lions, okapi and hundreds of other endangered species. It also houses the world’s only gorilla orphanage. The four that live there were orphaned as babies because of poaching and violence. They’ve been hand-raised by park rangers, who have devoted their lives to being gorilla mothers. It’s easy to spend hours on the viewing platform watching the endearingly humanoid apes go about daily life. Ndakasi has separation anxiety and, despite weighing 120 pounds, still demands piggyback rides from her caregivers. Matabishi is the baby, spoiled by one and all; Maishi is the tender one who fusses over Matabishi; and Ndeze is the bossy matriarch, whacking the others when she feels they’ve misbehaved. Unless the world acts now, there will be more of these orphans and fewer wild gorillas. Eastern Congo’s decade-long war is purportedly over, and Virunga has ramped up its tourism efforts in order to help save the gentle-natured apes. But the park faces another threat that may put an end to tourism before it becomes fully realized. 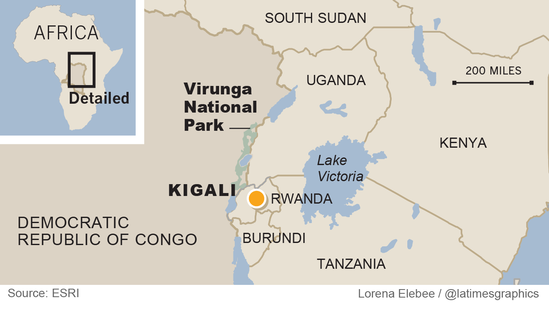 Virunga may be sitting atop immense oil resources. In a nation ranked by the World Bank as one of the poorest in the world, the temptations of this are overwhelming, even though Congolese law makes it illegal to drill in a national park, let alone a World Heritage Site. The proposed drilling area is not in the gorillas’ territory, but fighting has occurred over the park’s potential mineral wealth. In 2007 men with AK-47s traipsed into jungle and slaughtered nine gorillas, perhaps thinking that if the apes were gone there would be no reason to protect the park from mining and drilling. A new documentary titled “Virunga” exposes the behind-the-scenes skulduggery that occurs when the worlds of conservation and oil collide. Two days before the film’s New York premiere in April, De Mérode, who has vigorously protected the park and its animals and opposes drilling, was ambushed and shot four times. Incredibly, he survived and lives on to fight the battle. Will our insatiable appetite for energy in the name of progress leave us with a planet bereft of remote places and wild creatures? I sit still and look into a tiny gorilla’s eyes, and the tragedy of the wrong answer makes me angry.